Ford's defenders say his cabinet will include a balance of regional interests. 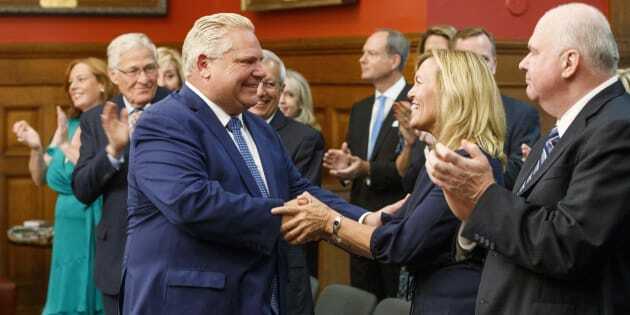 Doug Ford greets new Health Minister Christine Elliott before he is sworn in as premier of Ontario during a ceremony at Queen's Park in Toronto on June 29. TORONTO — Ontario's Progressive Conservative government had barely been in power for an hour Friday before it was under attack about the perceived lack of diversity in its cabinet. Shortly before officially taking the reigns of the province, Doug Ford announced the 20 ministers tasked with helping him shepherd the new government's agenda of fiscal restraint. But while the cabinet drew praise for enlisting members with considerable public and private sector experience, critics also noted the fact that only seven women and one visible minority currently have a seat on the front benches. Incoming Ontario Premier Doug Ford sits with members of his cabinet prior to being sworn in. Two out of three opposition parties said the makeup of the cabinet does not reflect the diversity of either the Tory caucus or the province as a whole. Political observers also noted the lack of diversity, but said the current cabinet composition makes an effort to balance different sets of interests including regional representation and willingness to commit to the promised agenda. The Progressive Conservative party did not respond to a request for comment. Critiques of the new Tory cabinet, which features plum portfolios for Ford's past political rivals as well as veterans of provincial and federal politics, began pouring in almost immediately after Ford delivered a speech to cheering supporters gathered outside of the legislature. Doug Ford greets people after being sworn in as premier of Ontario during a ceremony at Queen's Park on June 29. Newly elected New Democrat Sarah Singh, whose party now forms the official Opposition in the legislature, said the image of the predominantly male, white cabinet sends a disheartening message for those hoping to feel supported by the Ford administration. "For me as a young woman of colour, and I'm sure for many others across this province, they're not seeing themselves reflected in the decisions that were made today," Singh said after extending her congratulations to the newly minted ministers. Singh also criticized Ford's decision to assign the Indigenous affairs portfolio to a minister who's already overseeing the major files of energy and northern affairs. Doug Ford speaks as he is sworn in as premier of Ontario on June 29. That move, Singh said, suggests reconciliation with Indigenous residents will be a lower priority than it has been under past regimes. Similar concerns emerged from the camp of the Green party, whose leader Mike Schreiner made history in the June 7 election by being the first person elected to the house under his party's banner. Schreiner issued a statement lauding the depth of talent in the cabinet ranks, but lamenting that diversity seemed only confined to the skill sets on display. He noted that having only one member of a visible minority, Seniors and Accessibility Minister Raymond Cho, does not adequately represent four million Ontarians who identify as belonging to a minority group. Doug Ford supporters listen to the new Ontario Premier speak outside the Ontario Legislature on June 29. Schreiner also took aim at the comparative lack of women in the upper echelon of the new government, though Ford's two primary leadership rivals — Christine Elliott and Caroline Mulroney — were assigned the prestigious titles of health minister and attorney general respectively. "All governments should strive for gender parity, so it is unfortunate that just seven of the 21 ministers named today are women," he said. "This is made more troubling by the fact that you have reduced the Ministry of the Status of Women to a non-portfolio responsibility and unnecessarily changed the name to 'women's issues.'" Social media teemed with criticisms of the new cabinet, with hashtags such as #OnGovSoWhite decrying the lack of racial diversity gaining the most prominence. The cabinet represents white Ontario very well. Political observers said Ford's choices for high office send a message about where his governing priorities lie. Andrea Lawlor, a political science professor at Western University's King's University College, said the relatively homogeneous cabinet was formed from the ranks of a caucus rife with candidates from diverse ethnic and cultural backgrounds. The group does feature members from all across the province, however, and Lawlor said Ford's focus on veteran legislators may be an attempt to suggest that a new government is not necessarily the same as an inexperienced one. "I don't think it's an oversight, I think it's a notable absence," she said. "I think it suggests that, in an attempt to keep his cabinet as small or efficient as possible, he was ... going for the people who he knows will present his agenda and who he knows will have the experience to perhaps balance the fact that he is not only a new premier but a new (member of the provincial legislature) MPP." A Doug Ford supporter listens to the new Ontario premier speak outside the Ontario Legislature after a swearing in ceremony in Toronto on June 29. Rob Leone, a former Conservative member of the Ontario legislature, agreed that Ford's choices reflect a desire to showcase a combination of political savvy and people with skills to manage large files and organizations. Leone said he would expect to see a more diverse cabinet further into Ford's mandate when rookie caucus members have had time to get some experience under their belts. For now, though, Leone said he sees no problem with the current cabinet configuration. "People will assess cabinets on a variety of criteria, but the one that matters most is whether a minister does his or her job well," he said. "Our parliamentary system is about to put them to the test."